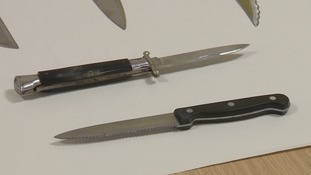 A serrated combat knife was among the deadly weapons handed in to police during a knife amnesty in Rushmoor in Hampshire. The amnesty began last week - one week after four men were sentenced to a combined 92 years for the murder of Richard Hardy. Hardy, who was 25, was stabbed to death in Farnborough earlier this year. Two amnesty bins were placed in Farnborough and Aldershot as part of a police campaign to reduce knife crime in the areas. All too often we are called to incidents where people have been seriously injured or killed because someone was carrying a knife. As we have seen with the murder of Richard Hardy, the reality is devastating for all those involved. Even getting one knife off the streets can potentially save a life. Getting 18 is great for us."